Professor Yorino specializes in electric power systems engineering. This academic field covers all aspects of the electric power energy that is essential in our daily lives: generation, transmission and use. The scope of his research is broad, ranging from large-scale, complex electric power systems used nationwide, to micro-grids (small-scale energy networks) used on outlying islands, and he investigates how to construct, operate and manage smart electric power energy systems. “Recently, the term ‘smart grid’ is used all over the world. ‘Smart’ means using information communications technology to raise overall usage efficiency of energy, and guarantee the system’s reliability and stability. It also includes technology that enables the effective use of unstable renewable energy”, says Professor Yorino. In actual fact, maintaining the reliability and stability of an electric power energy system is extremely difficult. For example, there are many ‘disturbances’ that may disrupt the controls, such as when a power system stops when lightning strikes it. Finding ways to avoid such disturbances is a global issue. 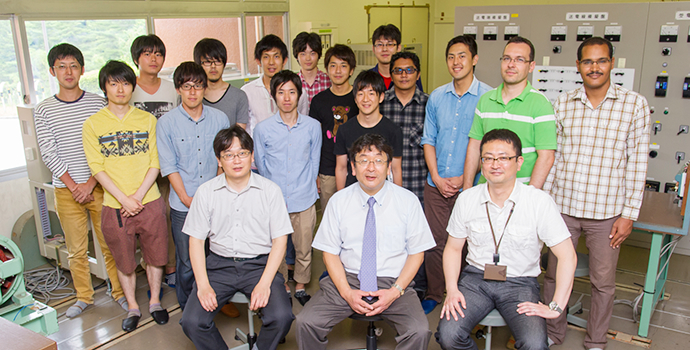 “Power outages occur frequently everywhere, but in terms of reliability and stability, to ensure that there aren’t any major power outages, there probably isn’t a university research lab in Japan that’s doing more than us. With the Critical Trajectory Method and others, we’re using analysis technology that is used nowhere else in the world as well as other advanced technology, to research new technologies that allow renewable energy to be utilized in advanced ways in electric power systems in the future”. “In the Taoyaka Program, we want to develop technology for building smart grids that are optimal for disadvantaged regions, focusing on renewable energy”, says Professor Yorino. In particular, in D1, he says that the plan is to utilize Engineering Department facilities and equipment that are in the process of constructing a micro-grid. 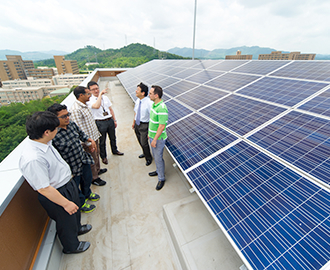 In the Engineering Department building there are solar panels installed on the roof and storage batteries and testing equipment in the basement. This means that the students will be able to learn how to construct a micro-grid by doing it themselves. Moreover, after that “Students will go to the respective disadvantaged regions with different environments, check the local needs on site, and then start working on building the optimal energy system. I believe that this is a major distinctive feature of this education and research”, says Professor Yorino. For the internship, they have launched the Higashi-Hiroshima Town Planning Association with the local residents, and are identifying issues and looking for solutions. They are now coordinating ways to implement the solutions in this area, which is close to the university. In the onsite portion of the program after that, “it is important that the students are not flustered or surprised, whatever happens”. Based on that, the objective is “to take the planning, operation and controls technology work that they have accumulated in their research so far and apply these to the construction of a system for the disadvantaged region, to build a feasible, innovative electric power system that maintains a good energy balance”. “This is ‘kind technology’ – reassuring, safe, and making people happy. These are the keywords we use, and by identifying issues in the regions I hope that our program will produce tough human resources who have comprehensive, global abilities”. In southern Asia, the region targeted in this program, it is not rare to see areas that have little or no electricity, and new methods that take a different approach from electric power systems in advanced nations are also being examined. Moreover, in Japan, while on the one hand there is an increasing number of depopulated areas all over the country, Japanese people also bear a huge burden from the electric power supply with uniform quality levels nationwide (universal service) that has been implemented up until now. From now on, it is likely that electric power supply to disadvantaged regions will be the next challenge. Under such circumstances, “Considering the current situation in Japan, I think that the Taoyaka Program is a very important and timely university initiative”, says Professor Yorino. “It is also extremely important in terms of human resource development and finding a breakthrough for energy issues too”. Professor Yorino is also very knowledgeable regarding the global situation, for many years serving as the president of IRFP, the international academic association that is a gathering of the world’s experts in this field. 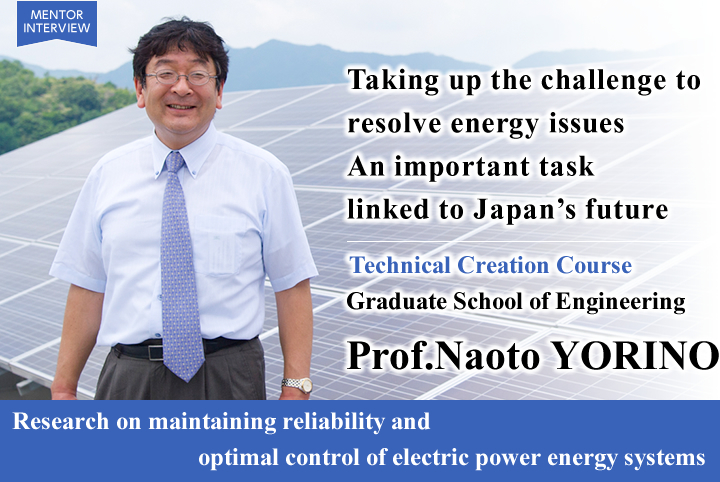 Since last year he is also a committee chairman at The Institute of Electrical Engineers of Japan, and in this position has been involved in activities to communicate to the general public accurate information on the engineering aspects of energy issues. 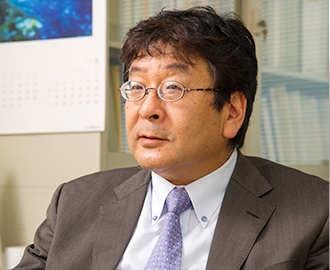 However, Japan faces various challenges, including the nuclear power plant issues, and Professor Yorino says that many people have still not realized how serious things are. “I see the Taoyaka Program as an advanced initiative that is making use of the current situation. And what I personally feel is that by resolving the energy issues in disadvantaged regions, we will find the solution for Japan to survive in the future”, he says passionately. Professor Yorino anticipates that the program will enable organic activities through the integration of the humanities and science, and hopes for results in many different areas. April 1, 1991 – September 30, 1992 Visiting Researcher, McGill University, Canada.